The value added tax raises the price on consumer goods. Almost all EU countries had a higher VAT-rate in 2012 compared to 2000. Perhaps surprisingly, Hungary has the highest VAT-rate, followed by Scandinavian Denmark and Sweden. 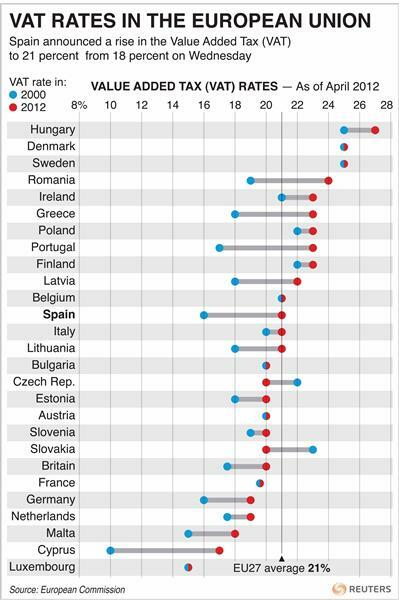 Cyprus, Portugal, Greece, Spain and Romania particularly saw their VAT rising in the last twelve years. Except for Cyprus, all of these countries have now a higher rate than the average for the EU of 21 percent. Thank you! I'm glad to find the information.